Opening a new account at William Hill allows online players to take advantage of a 100% bonus valued at up to £300. 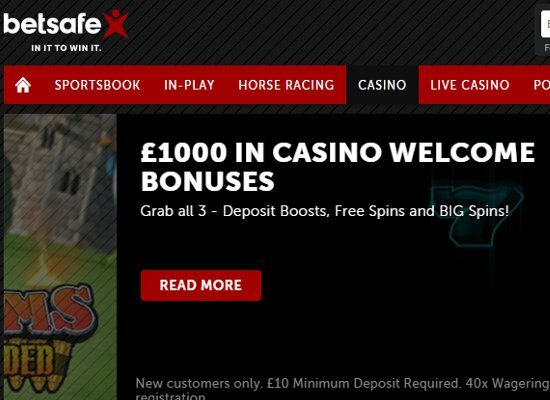 The bonus can be activated by a deposit of £10 on the initial deposit and is subject to 30x wagering. 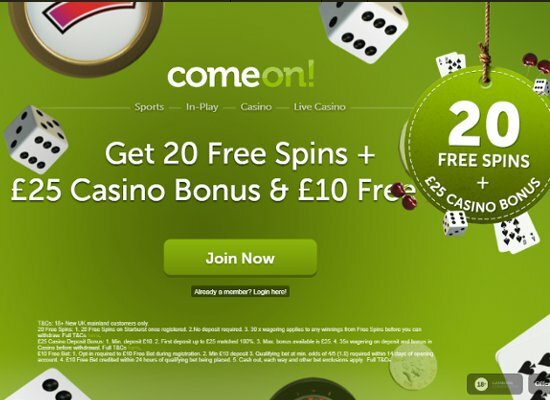 Members can also benefit from daily deposit promotion that offers £20 free. This bonus is available for all deposits valued at £30 or more and is subject to wagering of 30 times. William Hill also offers a wide selection of excellent promotions including huge cash giveaways on slots, tournaments and free spins bonuses. 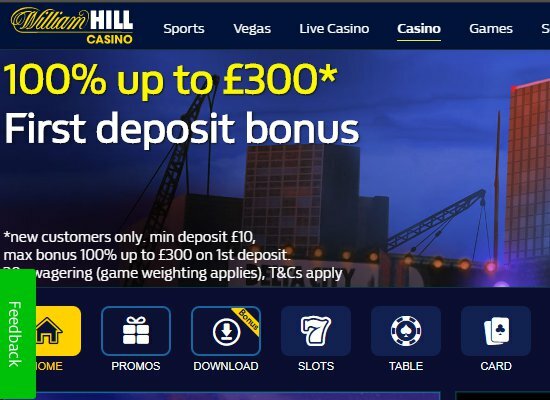 William Hill Casino is operated and owned by the UK based WHG International. British residing players can take comfort knowing the casino is licensed by the UK Gambling Commission, and for other jurisdictions, a license has been granted by the Government of Gibraltar. Known as the largest sports betting company, William Hill offers the best odds in Sportbetting, while members also have access to bingo, live casino games and an extended variety of casino games. William Hill is powered by award-winning software developers and earned its great reputation by offering advanced security, prompt payment of withdrawals, exceptional member assistance and generous bonuses in an all-inclusive gambling environment where privacy and safety are a priority. 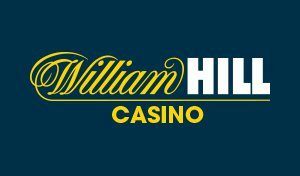 William Hill offers several gambling sections including sports, Vegas, games, live casino, scratch cards, bingo, poker and casino games. The casino games are available in several categories including slots, table games, card games, jackpots, live dealer games and new games. The vast assortment of slots includes classic slots, video slots, branded slots and progressive jackpot slots, while the huge selection of arcade games offer instant rewards. The gaming library is powered by some of the biggest names in software development including WMS, NetEnt, Playtech, IGT, and Microgaming. Some of the most played games according to member activities include branded titles such as Millionaire Drop and Deal or No Deal, while popular video slots include Wild Gargantuan, Mega Pots, and Plants vs. Zombies. Those with love for big jackpots will furthermore be pleased to learn progressive slots such as Major Millions, Mega Moolah and Isle O’ Plenty are available and ready to award you million dollar jackpots. William Hill offers one of the best selection of live dealer casino games, and the wide variety games include several different options in poker, baccarat, roulette, and blackjack. The live section is extremely popular due to the friendly, cheerful dealers, top quality video feed and challenging gameplay all contributing to an immersive live experience. William Hill is also one of the leaders in mobile casino offerings and provides mobile users with a phenomenal selection of casino games including slots, table games, live dealer games, bingo and card games. All games can be enjoyed on all iOS and android devices and players can be assured of the best audio and graphical quality across all platforms. Known as the home of betting, William Hill Casino offers exceptional customer support, and UK players can contact support via UK free phone, while separate UK numbers listed on site includes telephone betting, horse racing commentary and online as well as mobile support services. 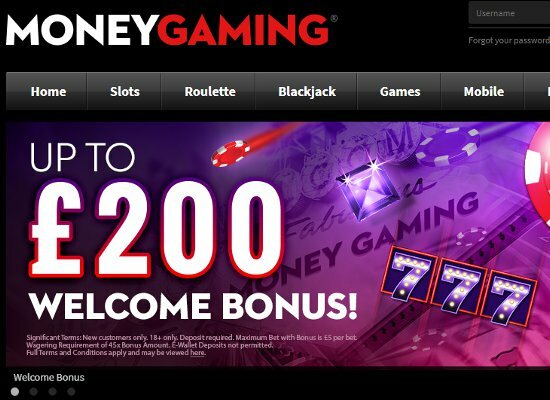 Designed to cater for international player requirements the casino accepts several currencies and at the same time offers a huge assortment of deposit and withdrawal methods. Banking options include credit cards such as MasterCard and Visa, while alternative methods include PayPal, Neteller, Skrill, EcoPayz, Entropay, Moneta, POLi, and Wire Transfers. All withdrawals are subject to a pending period of 24 hours and the casino guarantees players privacy and safety via the latest SSL encryption technology.